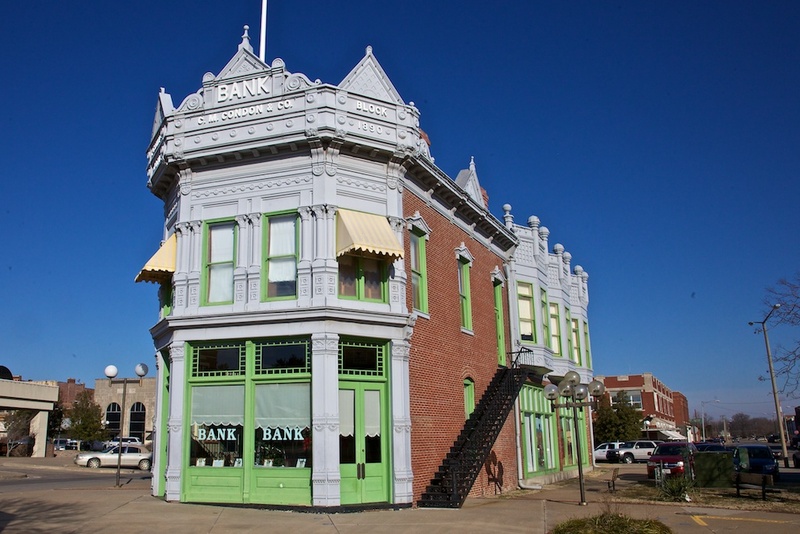 The Perkins building in Coffeyville, KS, dating to 1871, is most famous for the events that took place on October 5, 1892. On that day the members of the notorious Dalton gang decided to try to outdo the Jesse James gang by staging a broad daylight robbery of two banks simultaneously. The Condon bank was in this building and the First National was next door. Since they were known in town, the Daltons wore fake beards. Unfortunately for them, they were still recognized and some of the citizens and lawmen were arming themselves while the robbery was in progress. The resulting prolonged gun battle left four gang members dead as well as several townspeople shot. You can read their story here and even see a photo of the bodies. Several movies have been made about the Daltons.